You have two options for creating your account. In case you don’t have any projects when you enter in your account, you’ll see the next screenshot. You have to click on Start your first project. Or, the second option, in case you already have other projects you can click on New project. When you create a project using the standard process you have three steps. There is also the fine-tuning option which offers you lots of other settings. The first step is naming your project. Make sure you give an accurate name. It can be the name of your brand or website. Click continue and go to the second step. For an accurate analysis and a more in-depth mention collection, it is recommended to add your website, Facebook id and Twitter id. 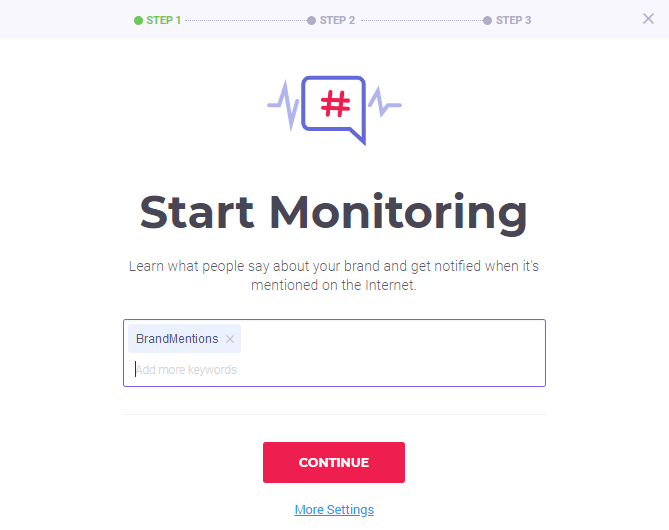 Adding the last two will give you the possibility to track social mentions also, besides the web mentions. 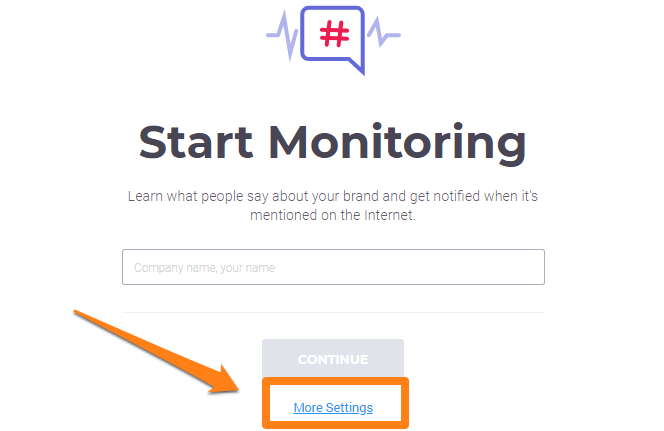 Start typing your brand name and if it appears in the list select it, for a quick setup. Then go to the third step. Define the language and country for the mentions you want to receive. You have drop-down lists where you can easily select the one that interests you. After you hit the Start Project button, give the tool a bit of time to gather all the mentions data. In just a few seconds, you’ll have full access to the mentions from the past 30 days. 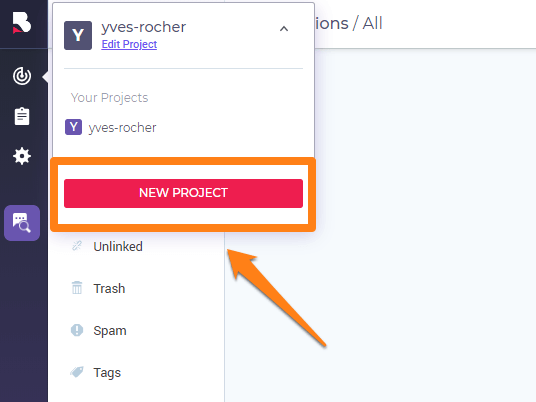 In the Projects section, you can view the mentions for the brand or topic you’ve created the project for. 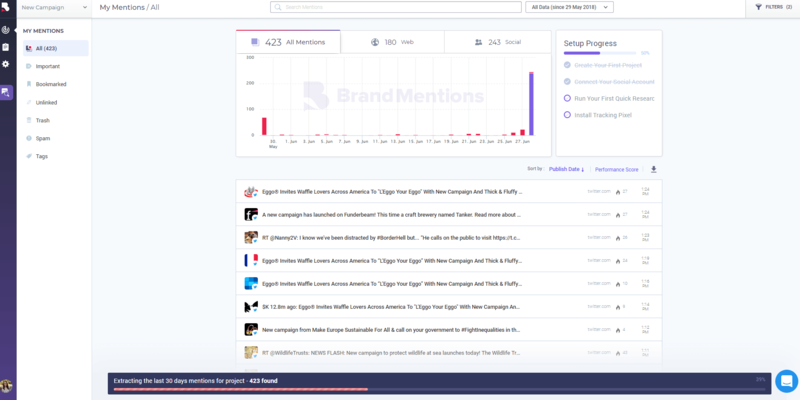 If you want to see the mentions for other brands, topics or keywords, you can start a new project following the same steps, or you can use the Quick Research Tool. 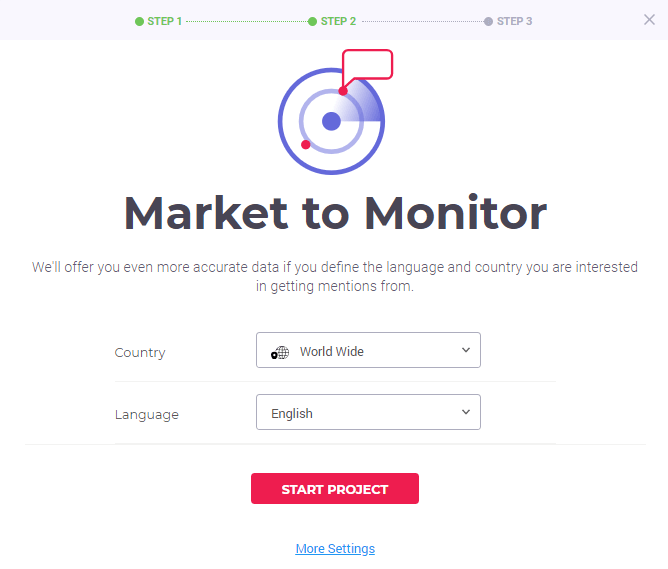 You have the possibility to add more settings to your project, right from the start, to get fresh and accurate mentions. All the information you add in these steps, you can edit later in the Account Settings. More than that, you can find more settings there. You can add keywords right from the start. Add keywords that you want to see mentions for. Make sure that after each keyword you add, you press enter (key) to be tracked as a separate and an individual keyword. Click on the X icon if you want to delete a specific keyword. To get the best mentions you can fine-tune your project excluding terms or adding complementary terms. 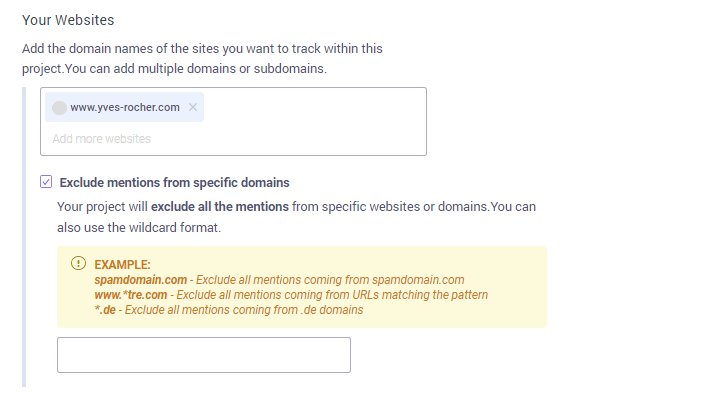 Exclude keywords in case you don’t want to receive notifications for specific phrases, that might not be relevant to your business. Include complementary keywords in case you have a generic brand name, such as Apple or Elephant. Add terms related to your industry, so you get only relevant mentions, and avoid eating up credits. You’ve created a separate chapter to help you find out how to best refine your keywords. From this step, you can also manage the domain names that are related to your project. By adding the relevant website(s) here, the tool will also be able to filter between linked-unlinked mentions. You can also exclude a list of domains; add them manually or use the wildcards format to exclude domains in bulk. Once you add here a domain, you will no longer receive mentions from there. In case you want to change the language and the countries your mentions are coming from, you can do that from this section. Select from the drop-down list what interest you most, to get the relevant mentions. Add your Facebook and Twitter social profile. Add them as @example and make sure you hit enter after adding a profile. 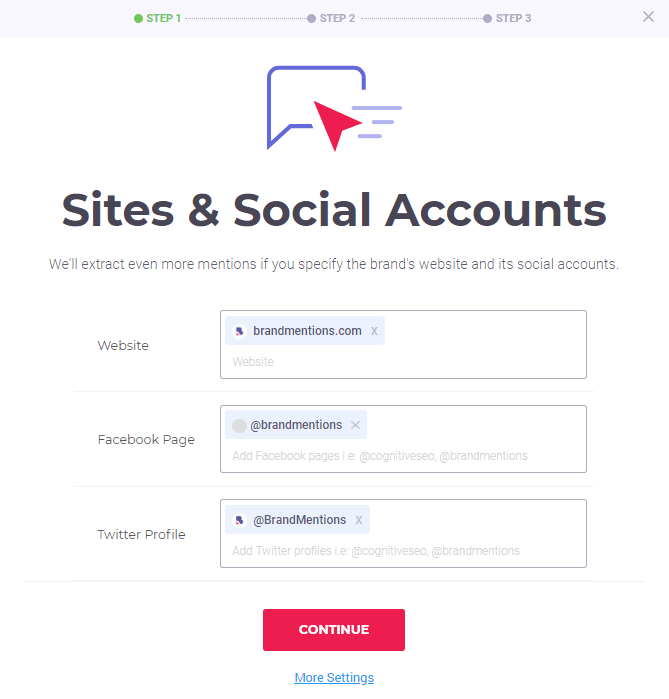 exclude mentions from other social accounts. 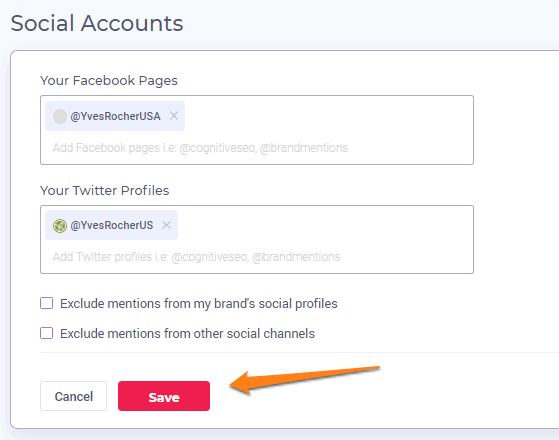 You can use the exclusion option if you don’t want to receive mentions from your own social accounts or from other specific social media accounts. You can choose to do so from various reasons: you want to see only external mentions, mentions coming from other social profiles except your own, etc. In the Sources section, you can select the places/platforms you’ll receive mentions from. You have a generous list to chose from, both from the web or from the social media. All sources are selected by default. In case you want to select/deselect any, simply tick in the box near it. 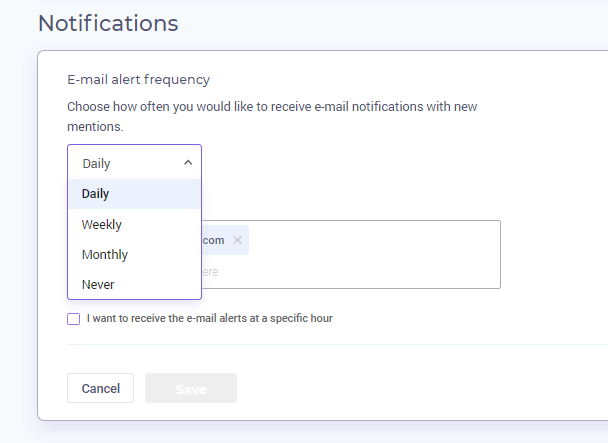 From this section, you can choose how often you would like to receive new mentions e-mail notifications. By default, you will receive emails once per day; in case you want to change that, make sure you select your favorite timing. You also have the possibility of selecting the exact time when you’ll receive the notifications. Check the box for “I want to receive the e-mail alerts at a specific hour”.